There’s something a little spooky about a Paul Davies painting. 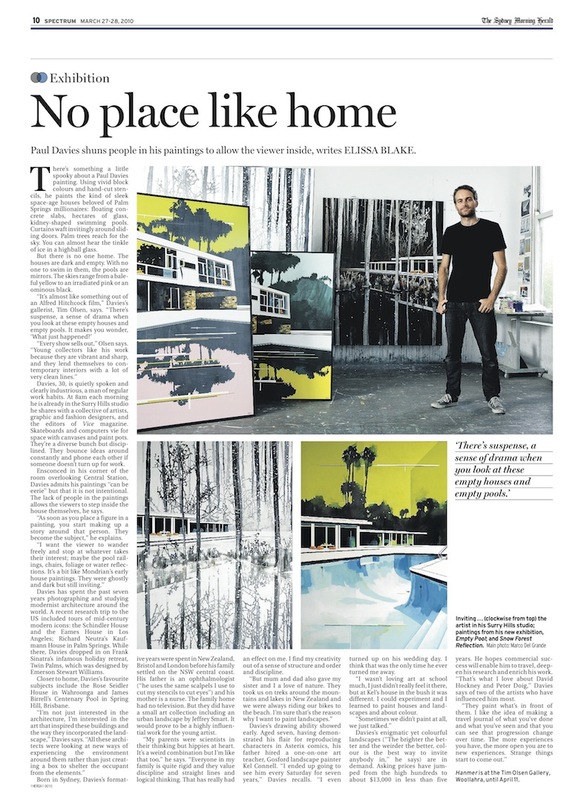 Using vivid block colours and hand-cut stencils, he paints the kind of sleep space-age houses beloved of Palm Springs millionaires: floating concrete slabs, hectares of glass, kidney shaped swimming pools. Curtains waft invitingly around sliding doors. Palm trees reach for the sky. You can almost hear the tinkle of ice in a highball glass. But there is no one home. The houses are dark and empty. With no one to swim in them, the pools are mirrors. The skies range from a baleful yellow to an irradiated pink or an ominous black. “It’s almost like something out of an Alfred Hitchcock film,” Davies gallerist, Tim Olsen says. “There’s suspense, a sense of drama when you look at these empty houses and empty pools. Its makes you wonder, ‘What just happened?’ “Ever show sells out, “ Olsen says. “Young collectors like his work because they are vibrant and sharp, and they lend themselves to contemporary interiors with a lot of very clean lines.” Davies, 30 is quietly spoken and clearly industrious, a man of regular work habits. At 8am each morning he is already in the Surry Hills studio he shares with a collective of artists, graphic and fashion designers, and the editors of Vice Magazine. Skateboards and computers vie for space with canvases and paint pots. They’re a diverse bunch but disciplined. They bounce ideas around constantly and phone each other if someone doesn’t turn up for work. Born in Sydney, Davies’s formative years were spent in New Zealand, Bristol and London before his family settled on the NSW central coast. His father is an ophthalmologist (“he uses the same scalpels I use to cut my stencils to cut eyes”) and his mother is a nurse. The family home had no television. But they did have a small art collection including an urban landscape by Jeffery Smart. It would prove to be a highly influential work for the young artist. “My parents were scientists in their thinking but hippies at heart. It’s a weird combination but I’m like that too,” he says. “Everyone in my family is quite rigid and they value discipline and straight lines and logical thinking. That has really had an effect on me. I find my creativity out of a sense of structure and order and discipline. “But mum and dad also gave my sister and I a love of nature. They took us on treks around the mountains and lakes in New Zealand and we were always riding out bikes to the beach. I’m sure that’s the reason why I want to paint landscapes.” Davies’s drawing ability showed early. Aged seven, having demonstrated his flair for reproducing characters in Asterix comics, his father hired a one-on-one art teacher, Gosford landscape painter Kel Connell. “I ended up going to see him very Saturday for seven years,” Davies recalls. “I even turned up on his wedding day. I think that was the only time he ever turned me away. I wasn’t loving art at school much, I just didn’t really feel it there, but at Kel’s house in the bush it was different. I could experiment and I learned to paint houses and landscapes and about colour. Sometimes we didn’t paint at all, we just talked.” Davies’s enigmatic yet colourful landscapes (“The brighter the better and the weirder the better, colour is the best way to invite anybody in,” he says) are in demand.